Welcome! We're Alex and Wendy Santantonio, owners and insane DIYers of not one, but two fixer uppers: an 1880s row house in Old Town Alexandria, Virginia as well as a 1908 foursquare, a short drive from DC but what feels like miles away from Beltway life. Having bought our first house in early 2003 just months after getting married, we purchased our row home in a "bachelor pad" state, having no idea what we were in for. After years of blood, sweat, and tears, not to mention most of our free time and savings, we've decided to share our story of do-it-yourself adventures, in hopes that others can learn from our successes and failures, and be entertained along the way. After 12 years of homeownership, we were itching for a new project and more space. While the natural thing to do would be to move, we simply couldn't leave behind the home we've lovingly renovated for over a decade. Therefore we decided to take on a new and second project with a completely different feel. Only a year in, we've been faced with more challenges than we bargained for (frozen pipes and toilets throughout the house, nearly six months without running water or HVAC, tick borne illness, tornado scares, and more), but we're not giving up. Even though we began our renovation journey in 2003, we're somewhat new to the blog scene having started Old Town Home in April of 2011. In this short time, we consider ourselves fortunate to have met so many fellow DIY and design enthusiasts, and have even been lucky enough to have been featured on Apartment Therapy, and in The Washington Post, Old House Journal, Northern Virginia Magazine and The Washington Post Express. We were even a winner of eCollegeFinder's Top DIY Blog Award, a finalist in Apartment Therapy's 2013 Homies for Best Home Projects & DIY Blog, and were named one of the 17 Best DIY Blogs in 2014 by Domino Magazine. Is it your first time here? Check out our Welcome Page or learn more as we answer FAQs and talk about why we DIY. From his keen woodworking skills to mad plastering abilities, Alex can do it all. Well, everything except deliver on time and under budget. A computer programmer by day, he's sure to go way overkill on the technology aspect of any project. Responsible for the major decorating decisions as well as keeping projects forging ahead, Wendy has an eye for detail like no other. She is also a licensed realtor in Virginia and DC, and specializes in Old Town as well as the other neighborhoods of Alexandria. The newest member of the crew, Lulu, our eight year old Ori Pei (Shar Pei Pug mix), is quickly learning the tricks of the trade and has been eager to help paint and observe whenever possible -- with or without a permit. When not slinking away to sleep on the job, Mel, our old Scottish Fold, served as our home’s chief inspector, anxious to examine every ongoing project, tool, dust pile and demolition zone. In his all too brief time as a member of our renovation crew, our Daug (Dachshund Pug mix) Oliver ensured that the proper safety gear was worn at all times, as well as provided perimeter security of the property. His side hobby was redecorating replastered walls and refinished baseboards...with his teeth. When not slinking away to sleep on the job, Mel, our 15 year old Scottish Fold, serves as our home’s chief inspector, anxious to examine every ongoing project, tool, dust pile and demolition zone. Love your gardening proyect...last year we built a small box and planted tomatoes...I was lazy and it was late in the season, so I just drop the bags of soil in the box sideways and poke holes on it; then just "planted" the small plants in the holes. Everybody made fun of my "technique" and said it was going to fail and what do you know? I had a bumper crop of tomatoes all the way through the fall! Beginners luck? I prefer to think I have a green thumb! That's hysterical Marlene. Sounds like you showed them! We're so glad you liked our gardening project and thanks for visiting. I'm a house tour contributor for Apartment Therapy and would like to discuss the possibility of setting up a photo tour of your place. I couldn't find an email address on your website, so I'm sending it through here. If you are interested, please email me at lindsayrwood@gmail.com. you have been busy on the website. I love the new treatments of your home for the header? Gesh, I am not a tech guru. ALEX... what are those things called? they are cool. LOL.. I just stumbled onto your site via the Victoria Elizabeth Barnes link. Must tell you that I enjoyed reading your crew bio's - sounds like my crew, hubby and me = contractor & designer. I love your design sense! Girls rock. I just happen to have grown up in Alexandria (uptown, near the Seminary), by the way. Amazing what has happened in Old Town since the 1960s. I just watched the video of the cat/dog fight. Hilarious! As a dog/cat owner I totally relate. The sound effects were a hoot! We just bought a house on n. Columbus and totally are interested in what the cost of your cast iron step project. Thank you so much for your post about buying your Volvo. My husband and I are planning to go abroad to do this as soon as I can order the hybrid XC90. I was going to order a 2015 model tomorrow but when I read about the hybrid I felt I had to wait. It was so nice to read about the trip experience and I can't wait to go! So cool you got to keep the plates. I just stumbled upon your blog while dealing with the loss of YoungHouseLove. I am from Cleveland, Ohio and also a Miami University alum! Your home is absolutely stunning. I'm so excited to start reading all of your archived posts! I can't believe I've been missing out. Welcome, Jayme! We're so glad you found us, and love to hear from fellow Clevelanders/Miami Alum. I am looking for the large rusty initials. Can I get the contact info for the vendor that has them? I'm glad I found youse..I live in Nassau County N.Y. My uncle lives in Queens. He got a cracked & sagging bathroom plaster ceiling. But it looks like its only th'top finis'layer ov plaster that's separated. th base or Brown coat layer seems to be still "keyed" in. Do I tear th' loose material & skim over th' firm base coat? & if so, what product shud I use? regular pre-mixed j.c. OR a "mixed"plaster product? OR do I RIP it down to th'lath & sheetrock? We are building a small cabin and are thinking about having the kitchen and bathroom counter tops made of cedar. We will be cutting our own seasoned cedar logs. Can you tell me if I need to use the same procedure to condition them as you did with the butcher block wood? 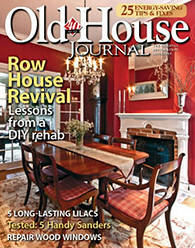 I just read your article "Window Restoration: How To Re-Rope Sash Cord." I am so grateful for it. You have a way of making people laugh and getting the main point across with clarity. I purchased a 1925 Pier & Beam Houston house. It has tons of windows just like the ones in your pictured article. Just like you, I discovered the website "smith restorationsash.com." My main question is "how do you clean and remove these heavy round weights?" Houston is a very humid place. Just read your NVM article and your comment that the master bath would be completed by end of 2012. Proof that the "best laid plans"... But considering all the work and challenges, not too bad on time. Still had to chuckle though. I found your site when investigating butcher block finishing. We just had a kitchen island built for us with a maple butcher block top. Someone told me I should use mineral oil, so I applied one coat prior to thinking things through. We don't plan to use it as a cutting surface just a food prep area with the use of cutting boards to cut on. after thinking things through I plan to use a polyurethane sealer on it so if we spill anything the wood will not absorb it, Now, i'm not so sure if I can do this as I did apply the mineral oil. Should I wait a certain amount of time, sand it good and then start over. How soon could I do something like this? in your site on installing spring bronze weatherstripping you mentioned installing weather stripping along the meeting rails. where can I find that instruction. Cool site on many weather aspects. Thought it might be of interest. Great during hurricane; sorry I didn't think to send sooner. Thanks for your great article on window sash restoration. I've just gone through a similar effort on my house in SF, Calif.
One suggestion - you may want to add a section to your article about the old window weights. I got through restoring my window, hung it up, and the upper sash promptly lowered itself - hmmmmm. After weighing the restored frame I discovered that its weight was 17 lbs. I had not changed the weight - still single pane glass - what was wrong? It seems the original weights from 1892 were never adequate (7 lbs each) and I never noticed because the window was so painted shut it stayed that way. Well, I found 8.5 lb weights, but then on returning home discovered that the side openings to the interior sides of the window frame - WERE NOT BIG ENOUGH TO ACCEPT THEM! Anyway, after some jigsawing and other maneuvers to widen the openings, the new weights went in, and work fine. Have you ever heard of such a nightmare before? Have you hear of the blog "Baltimore Brick by Brick"? They deconstruct decrepit homes in Baltimore. They have a store, Brick + Board, http://www.brickandboard.com/. In case you, somehow, haven't heard of this place. also - on your site I saw your wall of doors for closets in the bedroom. Any more details of this project? Hi Raef. Thanks for getting in touch. The walls in our home are actually plaster on wooden lathe, much easier to remove than those made of metal. (Although we work to preserve the original plaster wherever possible.) We had friends demo a bath with plaster/tile on metal lathe. It was weeks of intense demo with a sledgehammer/hammer/chisels, but eventually they were able to remove it all. Where did you get the yellow drapes in the bathroom ? Our Mosser Lee and LabTech home testing products will be featured on Designing Spaces on Lifetime Network Friday June 15th and again on Tuesday June 19th at 7:30 AM Eastern/Pacific Time. In the show, new homeowners Michelle and Darren express concern that without testing, unhealthy contaminants may exist in their new-to-them home. They embark on an inexpensive way to determine that they have a safe home environment, free from water contamination, airborne mold spores and radon gas. Additionally, they find a way to assure that their plants will have the correct nutrition to grow successfully. The program highlights the homeowner safety concerns that we hear every day from our customers. You can also see the peace of mind that Michelle and Darren get from annual contaminant testing and the ease of using our test kits. This is a unique opportunity to witness how consumers use and enjoy our test kit products. The best part – to celebrate this broadcast, we are offering you a FREE test kit of your choice to use and review for your readers! Congratulations! We are happy to announce that your blog has been included to the Top 20 DIY Blogs on our website https://sparpedia.ch/toplists/top-20-diy-blogs/. If this interests you, please send us a message and we are more than willing to answer your queries. I am writing to you regarding your inclusion in our Top 20 DIY Blogs . My team would like to help you gain more recognition. We could promote your blog by putting up a link to your blog in our list. This way our readers can find your blog easier. Let me know if you have any questions, and I will be more than happy to help you. I was wondering if ya'll could give me some insight as to how you went about connecting the corner joint and cutting the corner sink for your butcher block counters? I'm doing the same thing myself at the moment. I'm assuming Miter Bolts at the junction in all areas where the sink will NOT be (at the corner angle). We are a big flooring retailer and was wondering if you would like to do any feature on any of our ranges? Have you stopped your blog? I'll miss you. Hope you are both okay. Not to worry, we're still here. Don't have a ton of time to blog lately, but we're making lots of posts and updates on Instagram. Though we got inspired to make a post today. We'll hopefully have more frequent updates going forward, just gotta find a few more hours a week to write.